The purpose of the college was described as an effort to provide for the education of young women in literature, science and the arts. The Oct. 19, 1870, edition of the Franklin Repository stated that the "effort will not be to cram the minds of pupils with facts, but to spend the time in development of thought so that the pupils will learn to think for themselves, and thus become leaders, instead of followers, in society." The Hankey Center for the History of Women’s Education serves as the central resource on the history of Wilson College through the rich repository of materials and artifacts contained in the C. Elizabeth Boyd ’33 Archives. We provide support for academic programs by making the Center’s staff and resources available to the Wilson community, as well as to scholars, independent researchers and educators in the broader community. This timeline offers a brief stroll through moments in Wilson College history. Wilson College was founded in 1869 as a college for women, one of the first in the United States. The founders were the Rev. Tryon Edwards and the Rev. James W. Wightman, pastors of Presbyterian churches in nearby Hagerstown, Md., and Greencastle, Pa. They submitted plans to the Presbytery of Carlisle and received its endorsement in April 1868. The Pennsylvania Legislature granted the original charter on March 24, 1869. Miss Sarah Wilson (1795-1871), a resident of nearby St. Thomas, provided two generous donations for the establishment of the new institution. Although Wilson herself had no formal education, she recognized the importance of education for future generations of women. In gratitude for Wilson's gifts, the Trustees voted to name the new institution in her honor. Instruction at the College began on Oct. 12, 1870, after the Trustees had secured the purchase of property formerly owned by Col. A.K. McClure, a close friend and adviser of President Abraham Lincoln. Since its inception, the College has fostered rigorous intellectual pursuits. 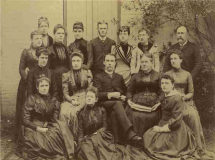 Like other women’s colleges, Wilson has long provided opportunities for women to study and teach subjects once thought beyond women’s capabilities, such as chemistry, biology, mathematics and classical languages. President Anna J. McKeag, Wilson’s first woman president (1911-15), strengthened the College’s academic standards. The College has continued to build upon this foundation by increasing the number and kinds of course offerings, improving library resources and bringing distinguished visitors and lecturers to campus. A measure of the College’s intellectual strength is the establishment in 1950 of a chapter of Phi Beta Kappa, the nation’s oldest and most prestigious academic honor society. Since 1931, the College has recognized outstanding contributions to society by awarding honorary degrees. Recipients have included U.S. Rep. Margaret Chase Smith, Supreme Court Justice Harry Blackmun, anthropologist Margaret Mead, musician Lili Krause, author and activist Rita Mae Brown, and news anchor Walter Cronkite. Throughout its long history, Wilson has responded to changing times. In 1982, the College was one of the first in the region to begin offering a continuing studies program to meet the needs of a growing population of adults seeking a post-secondary education. In 1996, the College was one of the first in the nation to offer on-campus, residential education for single mothers with children. Since the program began, it has won national attention and Wilson has become the National Center for Single Mothers in Higher Education. Today, Wilson admits men and women of all ages to enroll in its bachelor's and associate degree programs, as well as post-baccalaureate and graduate programs. To make a Wilson education available to adults, many courses are offered not only during the day, but in the evening, in summer and January Term, and at convenient off-campus sites. Traditions are an important part of every student’s Wilson experience. From Bigs and Littles to Sophomore Buddies, traditions bring our students together and make them part of a supportive, connected community.